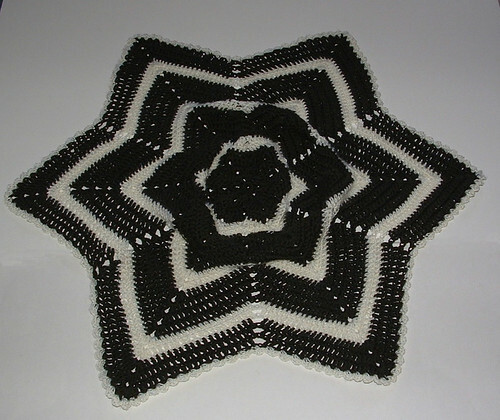 I recently crocheted a six point round ripple and the center was bowl-shaped. 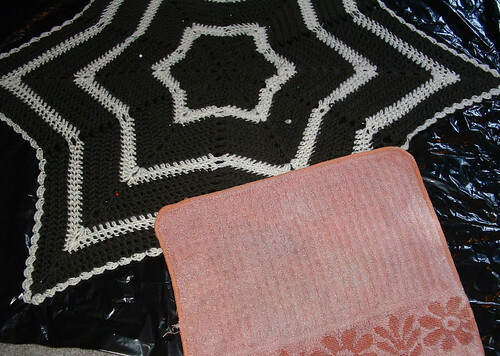 So I looked around for a picture tutorial on how I might block the crocheted afghan. I haven’t tried blocking an afghan before as usually they lay flat but this one had an issue and I was so hoping that I could straighten it out by blocking it. 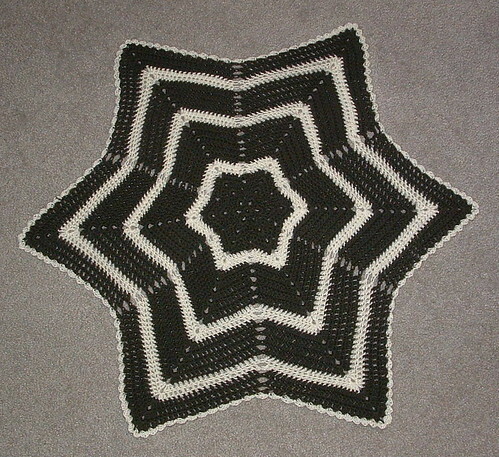 After looking around the Internet, I read several different tips on how I might do the blocking but nothing with photos. Well as I’m a visual type person, I wanted photos with step-by-step instructions. 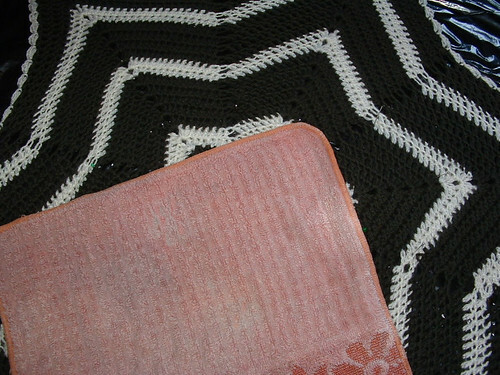 After reading a few ideas, I set out on my own and created my own picture tutorial for blocking my rumpled-up afghan. Here is my round ripple baby afghan before blocking. As you may see, the center is all rumped up and isn’t laying flat at all. I put down a plastic garbage bag on the carpet and then placed my afghan on it. I gently stretched the points and center and then pinned it down into the carpet to flatten it. Put your pins in at an angle to hold down your blanket as you stretch it. Push down on the center to flatten it further and move your pins to stretch the afghan until it is laying down as flat as you can get it. Next dampen your afghan with a wet cloth or use a spray bottle to gently wet the material. With the cloth or your hand, flatten the center down and move the pins as needed to stretch the blanket flat. Move the wet cloth around as shown to moisten the yarn so it blocks evenly. After dampening and flattening your afghan, allow it to dry completely before removing the pins and moving the blanket off the plastic. The next day my blanket was dry so I removed all the pins and the blocking was very successful as this baby afghan is relatively flat and looks much better now.